Today while surfing the Internet, I stumbled into a blog that appeals to me very much. The blog describes the curriculum to be a professional data scientist. Despite listing a long table of books and papers, the key elements to make a full data scientist are illustrated lively with a metro-map, with each lines stands for a particular subject to learn. The stations on each line are related knowledge points in that subjects. 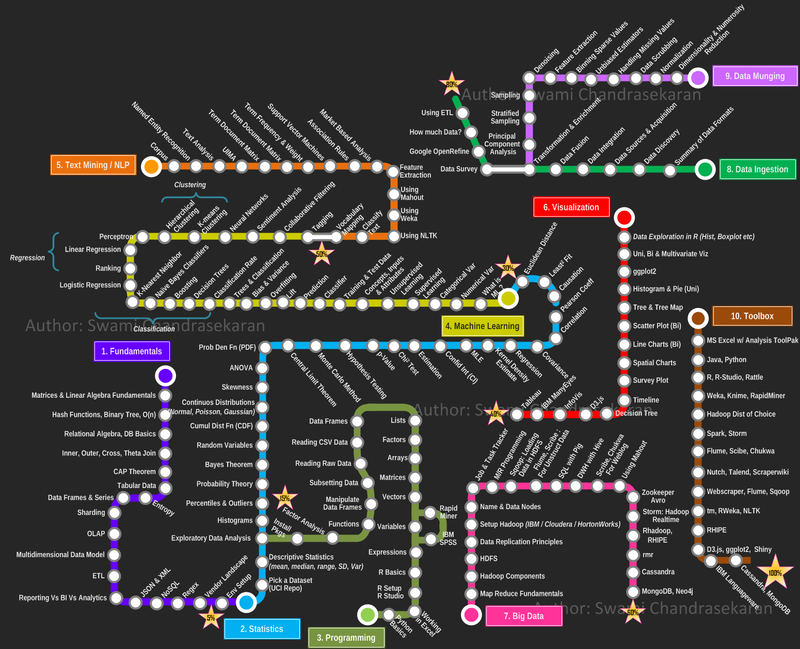 Therefore, to become a data scientist, one can start anywhere, but travel all the lines of the metro-map, by completing learning all the knowledge points one by one. It is a huge task for anyone, but only those who are able to accomplish can be the professionals. As a fan of big data, the map is quite attractive to me. So I saved that map and I would like to print it out and hang it on my wall. I would like to have a travel along the way!